We had a pretty exciting weekend! Friday we didn’t so much except go grocery shopping. 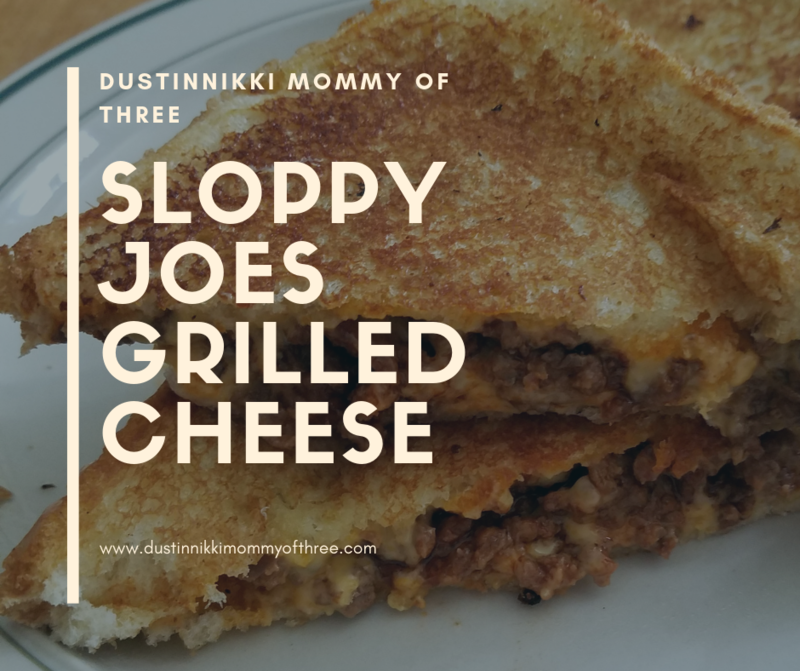 Sunday was our lazy day where we spend it watching NASCAR. 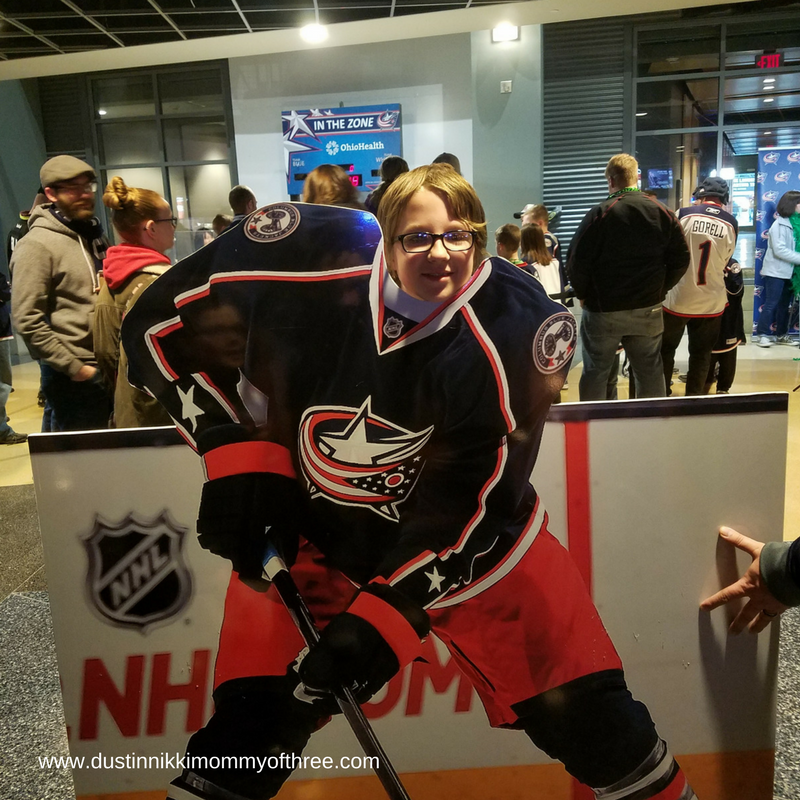 On Saturday though, we went to the Columbus Blue Jackets hockey game up at Nationwide Arena. 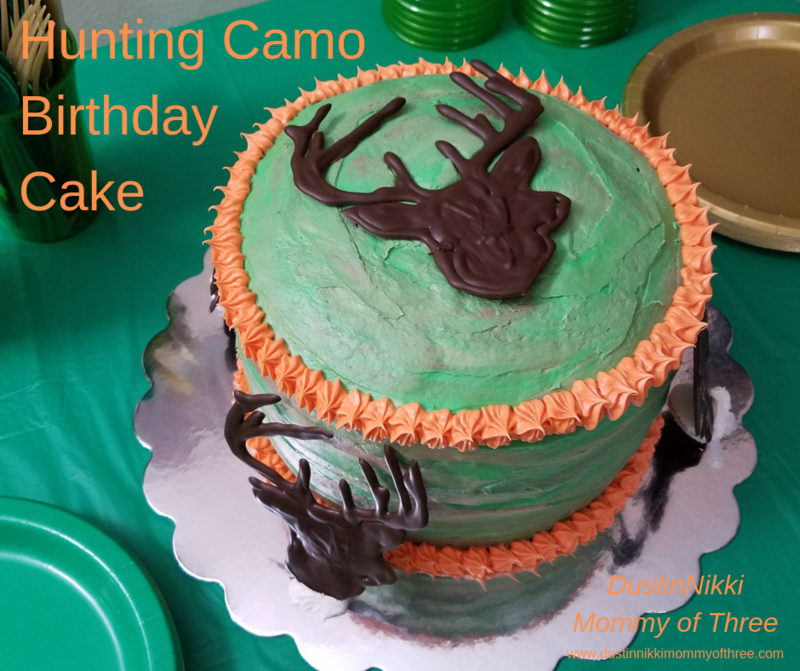 We were actually hoping to get tickets to the game for the night we had our older son’s birthday party a few weeks ago but we couldn’t get them for that night. So we got tickets for a few weeks later. We picked up our son’s buddy and took him with us. Our kids have already gone a few times but this was his best friend’s first time. They were all pretty excited. 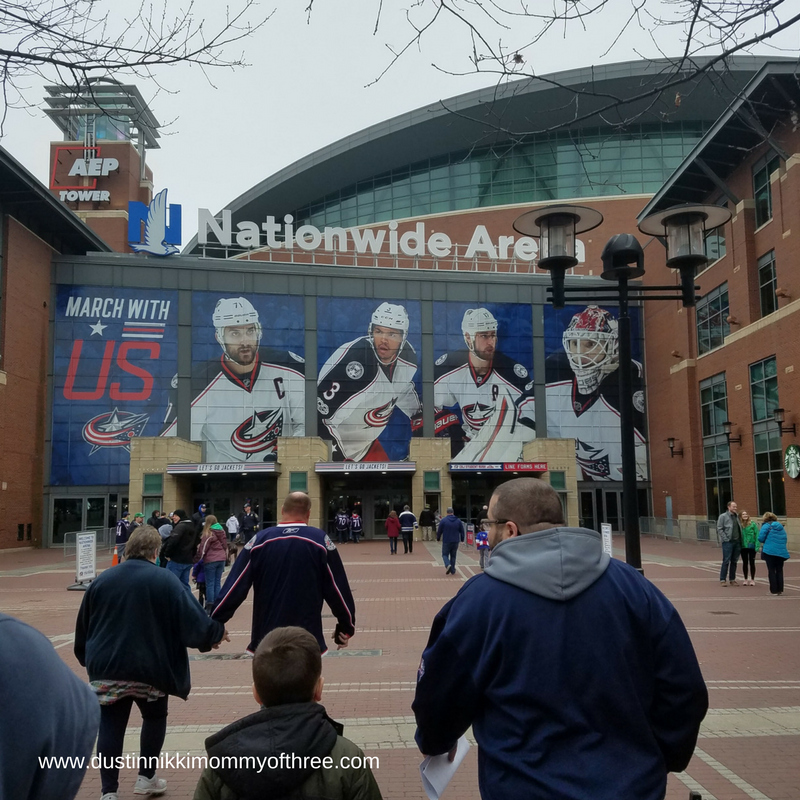 Nationwide Arena is located in downtown Columbus (Ohio) in the Arena District. Parking is always pretty decent. Parking garages range from $10 to $20. We have never seen anything that costs more than that. We have gone to OSU football games and Cincinnati Bengals games and ended up paying twice as much at both football stadiums. Even if you pay $10 for a garage that requires a bit of walking, even that isn’t a whole lot of walking really. I love the Arena District. The roads are brick, there are restaurants everywhere so you can even go early and hit one up, there’s a big Tim Horton’s (which makes sense since it’s one of their sponsors) right next to the arena with indoor and outdoor seating. But I love walking though the district especially at night with all the neons and everything. It’s a really nice area. There are people everywhere and it’s a really nice atmosphere. There’s not a whole lot of traffic through the district. People who are going to the game have gone to parking garages and people must tend to avoid the area for the most part if they aren’t going to the game. The city of Columbus does a pretty good job with directing traffic and walking people. 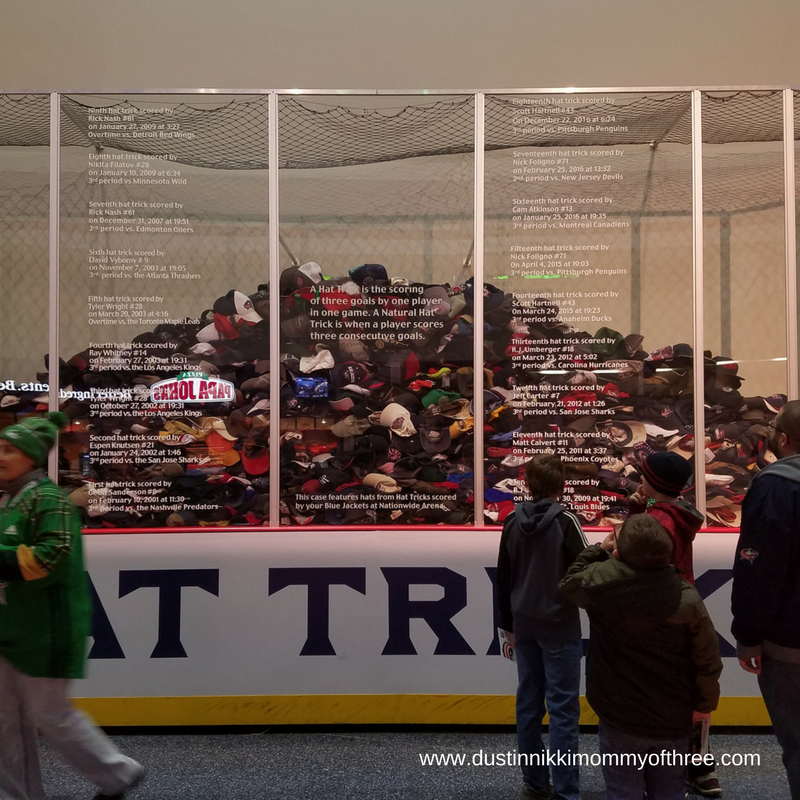 There’s a few things you can see at the arena before heading to your seats. The photo above is a picture of the Blue Jackets practice rink. The kids thought that was pretty cool. 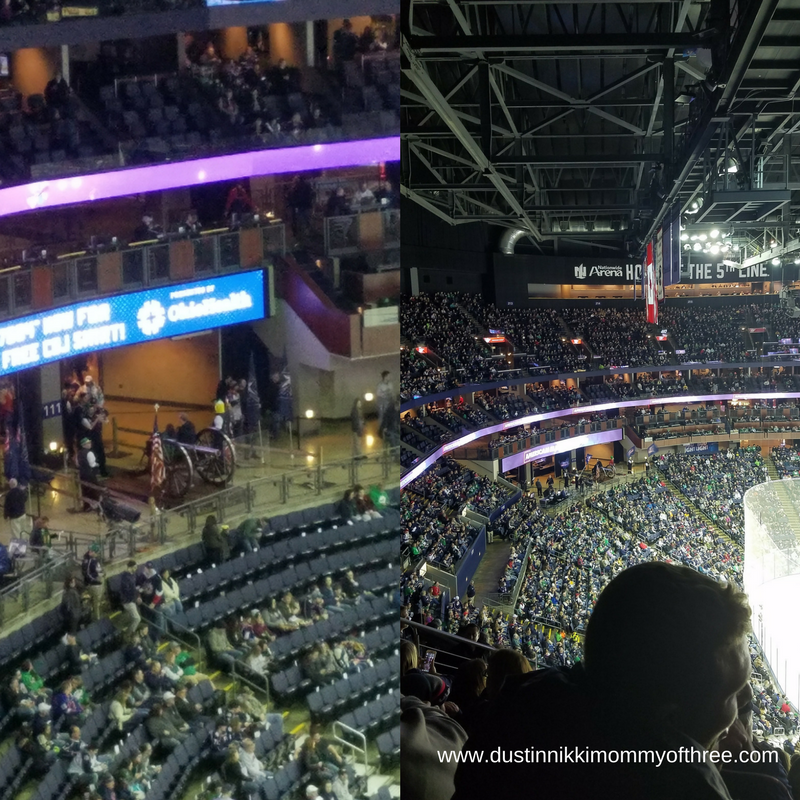 The Blue Jackets have a cannon that is fired off after every goal they score and there is an area where you can get to the cannon and take your own pictures with it. The kids love seeing the Hat Tricks. If you don’t know, in hockey, a Hat Trick is when one player scores 3 goals in one game. If that happens, fans throw their hats on the ice. Then they are collected and put in the Hat Trick bin (I guess that’s a good word for it I suppose). 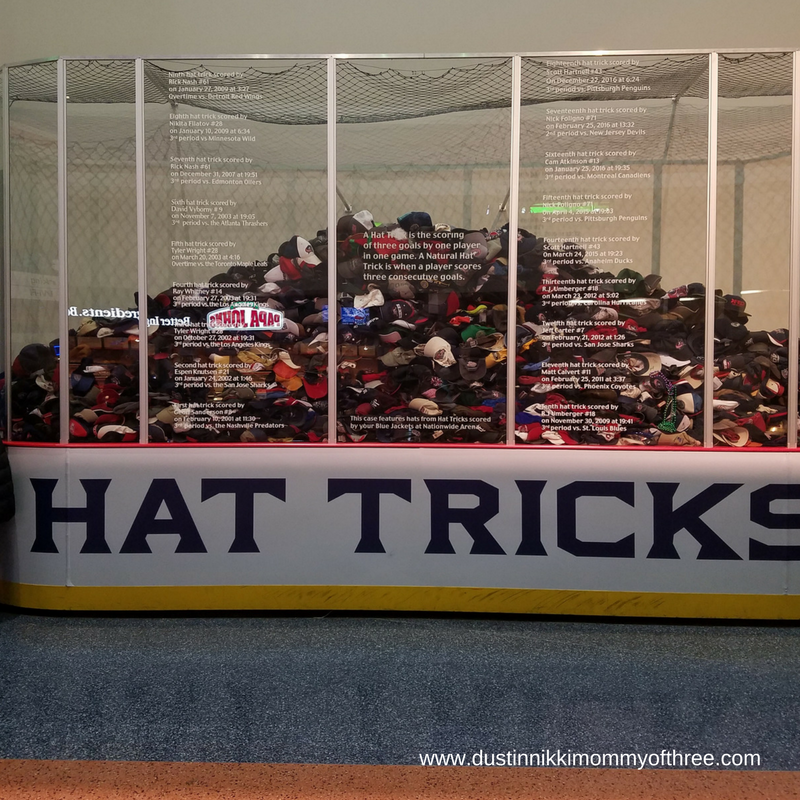 On the front of the Hat Trick casing, it explains what a Hat Trick is and lists all the Columbus Blue Jackets players that have ever scored one and includes the date and game that was played. We saw one Hat Trick in person once and it was pretty exciting. It’s a bit of fun hockey history. There are other cases that display Columbus Blue Jackets history as well which is also nice to check out. There are tons of concessions around the arena on all levels. Escalators to take you to the upper bowl seats so you don’t have to climb stairs unless you want to. There’s an activity area for kids where they can play games and do other activities. There are even a few of these cutouts for some fun photo opps. The kids loved these things! Every time they saw one they jumped right up to it telling me to take their picture! The photo above is the picture of the cannon from the inside where the seating is. It’s so exciting when the cannon fires. Of course it’s always exciting when our Jackets score but it’s even more exciting when that cannon goes off. One of the previous times we went to a game, we were sitting pretty close to us and it was pretty darn awesome! The seating is pretty comfortable but when you are in upper bowl seating, it feels kind of strange until you get used to it because you are up there pretty high. Usually when we take our kids, we get the cheap upper bowl tickets because instead of buying only two tickets, we are buying five. My husband and I have gone to a couple games in the lower bowl and that was pretty exciting too. One time we had Red Line tickets and were 6 rows up center ice. Now that was pretty darn sweet. We also had access to the Red Line Lounge and where they have dining seating and serve a really good meal. If you are looking at upper bowl seats, ticket prices are pretty good. You can find them as low as $10 each sometimes. A lot of times they also offer family deals too which also include food and drink too. 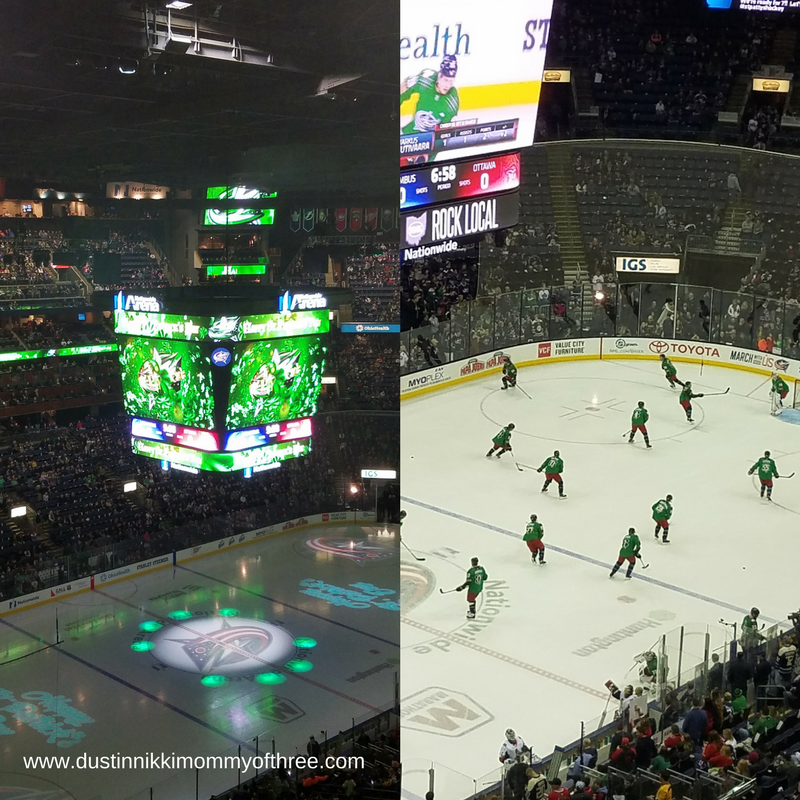 Saturday was also St. Patrick’s Day so of course the Columbus Blue Jackets celebrated. During warm-up they dressed in green jerseys. The kids thought that was pretty cool. They celebrate other things as well. One of the games that we went to was military appreciation night and I was so glad we were at that game. 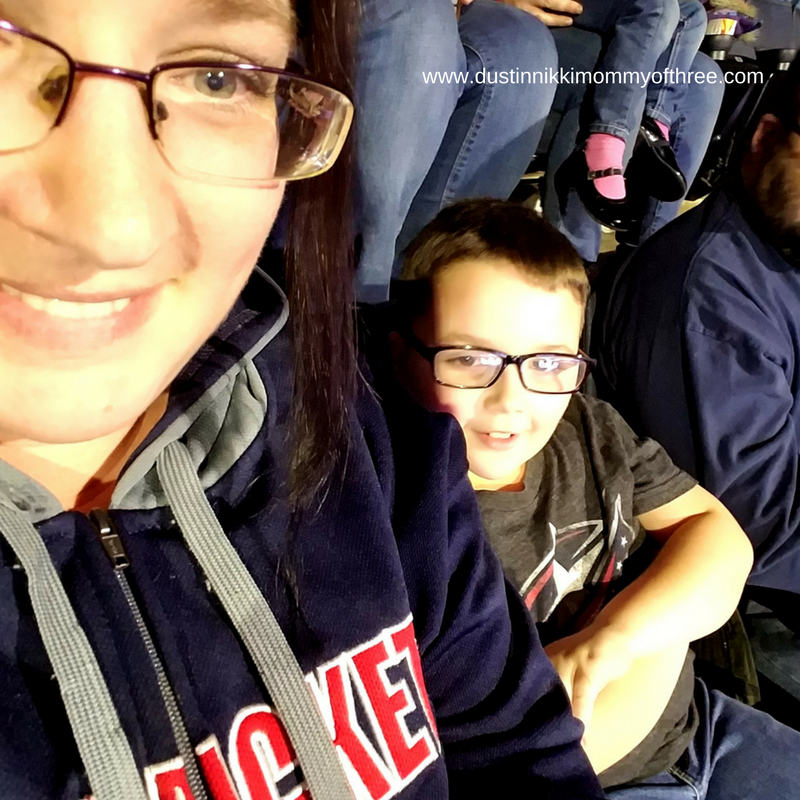 I was glad we were at this game too because since CBJ played the Senators, we were not only there for our National Anthem, but we were also there for Canada’s National Anthem as well. CBJ has Leo who sings our National Anthem and he always sings Canada’s first every time CBJ plays a Canadian team. He does such an amazing job. 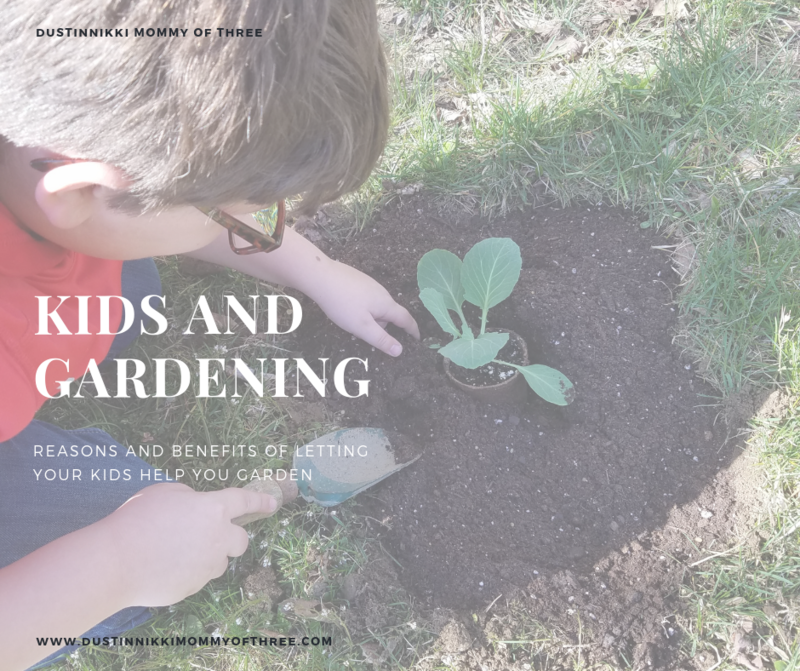 The kids had a lot of fun and we had a blast. They were up jumping and yelling when they started throwing free t-shirts like they always do at each game. They also throw pizza boxes for free pizza and the kids loved trying to grab one of those too. One of them almost got one. I love going to hockey games. We don’t miss a single game on TV and as much as we love watching on TV, there’s nothing like being at a hockey game in person. Even if you don’t care for hockey or are not even a fan, it’s amazing to watch in person. My sister went with us one time and other than the occasional football game, she doesn’t really like watching sports. 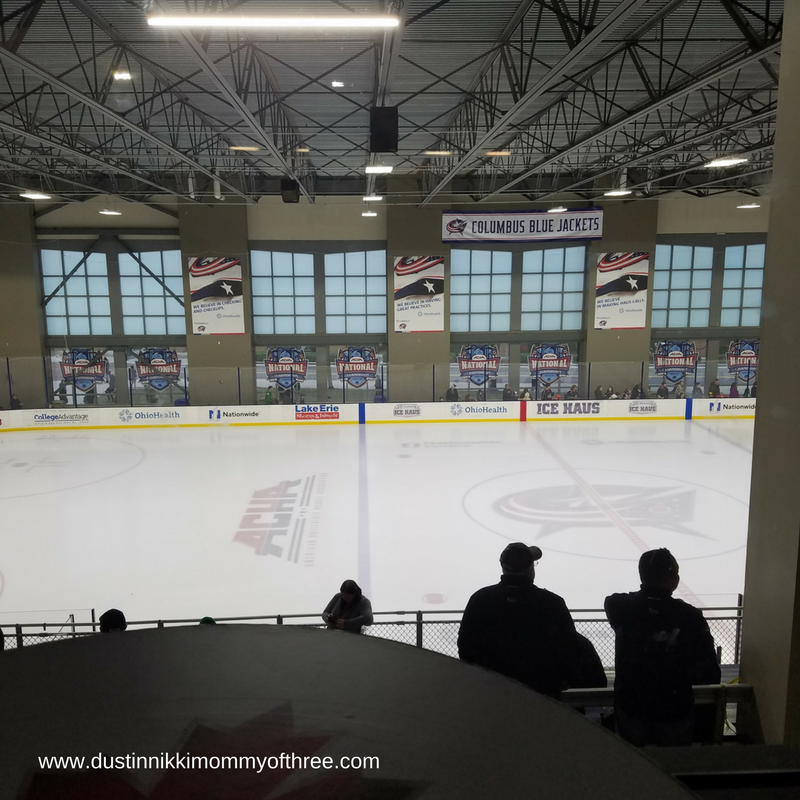 I don’t think the woman has ever watched a single hockey game on TV but she said that was the most fun thing she had ever seen when she went and saw a game at the arena. There is a really great atmosphere at Nationwide Arena. It doesn’t matter if you are a hockey fan or not. 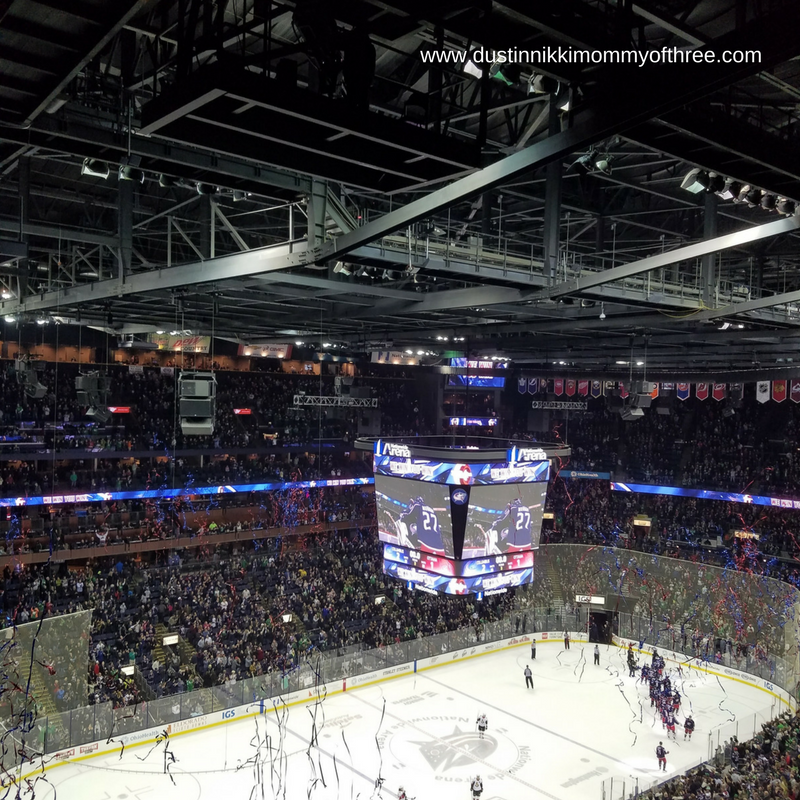 It doesn’t matter if you are a Blue Jackets fan or if you are a fan of the other team. 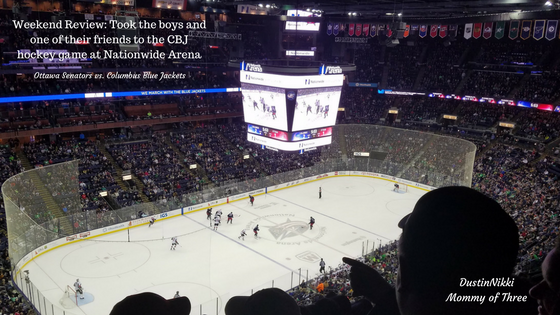 I might be a little biased when I say that because we are hockey fans and we love our Blue Jackets but it really is a pretty great arena. And to make the night even better. WE WON! And of course we could never miss the Sergei Bobrovsky and Nick Foligno hug.